Biologist-designed boating searches optimize sightings and photography. 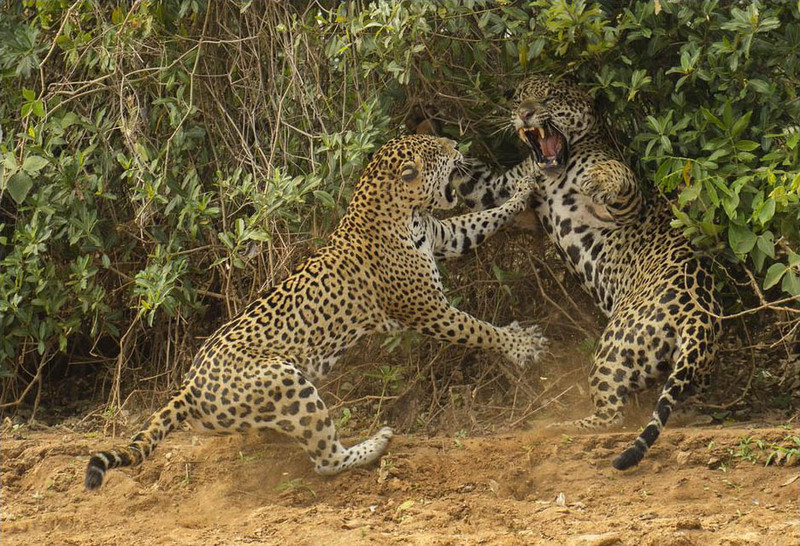 Wild Jaguars in a lovers’ spat, Pantanal, Brazil. Photography: Joe McDonald. Jaguars of Brazil’s Pantanal. Our guests include the world’s most sophisticated, prize-winning nature photographers. These demanding professionals choose our Jaguar tours for many reasons, one of which is that our highly-experienced boat drivers have more contact time with wild Jaguars than any other humans in the history of the world (over 3,000 hours in the case of our top drivers). Thus, our boat drivers are the best in the business in terms of predicting Jaguar movements and behavior. Our boat drivers’ deep experience results in our guests being perfectly-positioned to take prize-winning photos of explosive Jaguar behavior that is all over in a split second. Our departures achieved 100% Jaguar success in 2011, 2012, 2013 and 2014. In 2013 and 2014, our guests enjoyed an average of 2.5 Jaguar sightings per day, a 50% increase over past rates of sighting from previousl already-high rates of 1.0 to 1.5 cats per day. Many guests were astounded by 4 to 6 Jaguar sightings in one day. One group had 12 Jaguar sightings between breakfast and lunch. A group of guests in late October through early November 2013 marveled at 25 sightings in a five-night stay at the Jaguar Flotel. © Inka’s Empire Corporation 2014. All rights reserved.